Commissioned in the US Air Force as a fighter pilot. After receiving a Master of Science Degree, Anders was assigned to the Air Force Weapons laboratory and given responsibility for technical management of nuclear power reactor shielding and radiation effects programs. 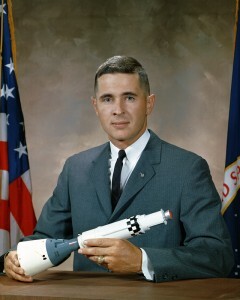 Replaced Michael Collins as a crew member of Apollo 8 after Collins became ill. Along with Frank Borman and James Lovell, Anders became one of the first three humans to ever travel from the Earth to the Moon. 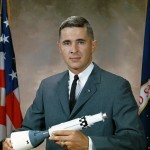 Left NASA in 1969 and served as the executive secretary of the National Aeronautics and Space Council from 1969 – 1973. Appointed to the Atomic Energy Commission in 1973. In 1975 he was chosen by President Ford to become the first Chairman of the new Nuclear Regulatory Commission. Appointed the US Ambassador to Norway. Left the US government in 1977. He worked for a number of large corporations including General Electric, Textron, and General Dynamics which he retired from in 1996. He is President and Director of the Anders Foundation, which is a philanthropic organisation. Holds the rank of Major General in the Air Force Reserve.